The Dragonara Casino Co. Ltd has embarked on the restoration of the external colonnaded portico around the four sides of the Dragonara Casino in St Julians, the company said. 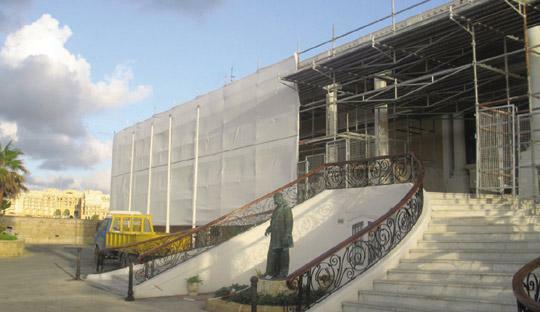 Works, costing €500,000 (Lm214,650), started on January 21 after years of study and evaluation of methodologies for the restoration by Casino architects and the Malta Environment and Planning Authority (Mepa). A Casino spokesman said all safeguards have been taken to protect both Casino employees and patrons. The restoration is expected to be completed by the end of July. The Casino will continue to operate in the meantime. A tender for the works was awarded to Agius Stoneworks. Works are being monitored by a specialist in restoration engaged by the Casino on behalf of Mepa. The restoration works comprise a careful analysis of the state of the masonry and steel elements making up the structure. Works includes the removal of all plasterwork applied in previous years; cleaning and removal of salts from the masonry surfaces, restoration and repair of elements found to be in a satisfactory condition and the replacement, in extreme cases, where deterioration has affected the masonry heavily. The project will also include the dismantling of certain sections with attention being given to the numbering of all stone blocks that are removed so that they can be placed again in their original position.